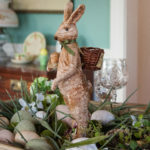 Are you ready for spring and Easter? I sure am! 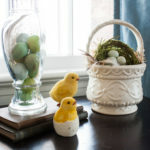 Easter is still over a month away, but it’s never too early to start thinking about how you want to decorate your table. 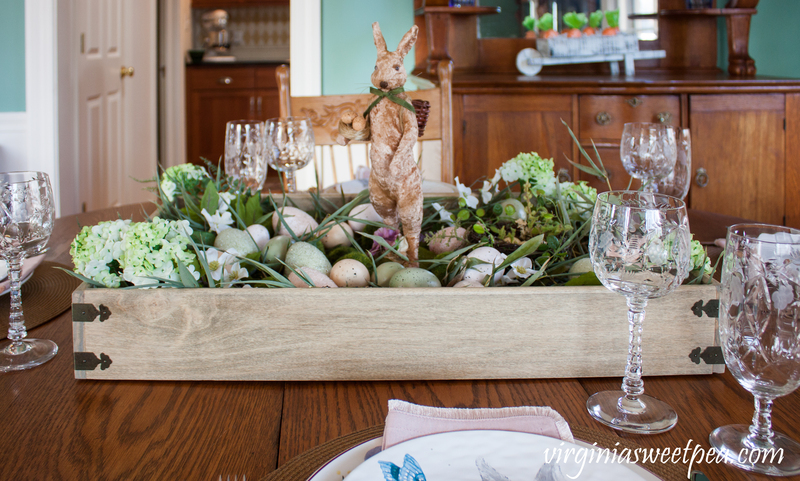 Today I’m sharing my Farmhouse Style Easter Centerpiece and Table and I hope you’ll get some Easter inspiration for your own Easter table. 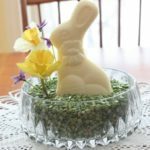 Today’s Easter centerpiece and table is actually a Pinterest challenge that I’m sharing along with a group of blogging friends. Cindy from County Road 407 picked an inspiration Easter centerpiece from Pinterest and challenged our group to recreate the look. Many thanks to Cindy for hosting this challenge and for Lisa from A Simply Styled Nest for providing the inspiration picture. If you are coming here from Stilettos and Shiplap, welcome! I am sure that you enjoyed seeing Tara’s version of our inspiration picture. You’ll find a list of all of the participating bloggers at the end of this post. I’m looking forward to seeing how everyone recreated this look. Isn’t this a beautiful table? When Cindy sent this picture to me, I couldn’t wait to get started on this challenge. I examined Lisa’s beautiful table, thinking about what I would need to create this look for my own home. I thought about what I already have that I could use and what I would need to purchase. Wood tray for the centerpiece – I used one that I made a few years ago. Get the tutorial here. This is my version of Lisa’s pretty table. I set my table in our formal dining room, a room that I don’t often share with you; I usually share tablescapes set in our breakfast room. 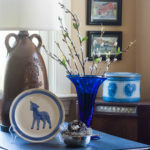 Our formal dining room gets beautiful morning light and even though we don’t often use it as a dining room, it’s a room that we enjoy each day as it connects to our screened porch where we enter and leave our home. I can’t tell you how much I’ve already enjoyed this Easter centerpiece. Every time I walk through the dining room, it puts a smile on my face. After I made it, I sent a picture of it to my BFF cousin and that night she texted me with, “I can’t stop looking at your Easter table.” What a compliment! As I made the centerpiece, I took pictures of the stages so that you can copy this look for your home. I started with the tray and rabbit. I made the tray a few years ago and it usually is used at our lake house on the coffee table for holding magazines and coasters. If we had a tv there, it also would hold remotes. I bought the rabbit long ago at a local home decor shop that is no longer in business. I elevated the rabbit using small peanut butter containers from a hotel. A can of tuna would have been the perfect height for elevating the rabbit but I had none in my pantry. Next I needed to surround the rabbit with greenery. 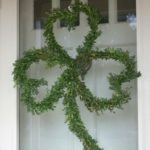 I thought about buying faux greenery but didn’t want the expense nor the trip across town to purchase it. Instead I used Bamboo that grows between our house and our neighbor. We’ve been fighting this Bamboo for 25+ years and it’s finally great to use it instead of trying to kill it. The Bamboo looks like thick grass and it has since dried and is still green and pretty. The next step was adding a nest and flowers. Lisa used Hydrangea and I used a smaller Hydrangea blooms that I had in my stash. Lisa also used both pink and white flowers. I didn’t have any pink flowers in my floral stash but I did have white Dogwood. Dogwood is a true sign of spring here in Virginia and it is our state flower. The last step was to add eggs to the centerpiece. I didn’t have any pastel eggs to use and found exactly what I needed at Pier1. I used these and these. 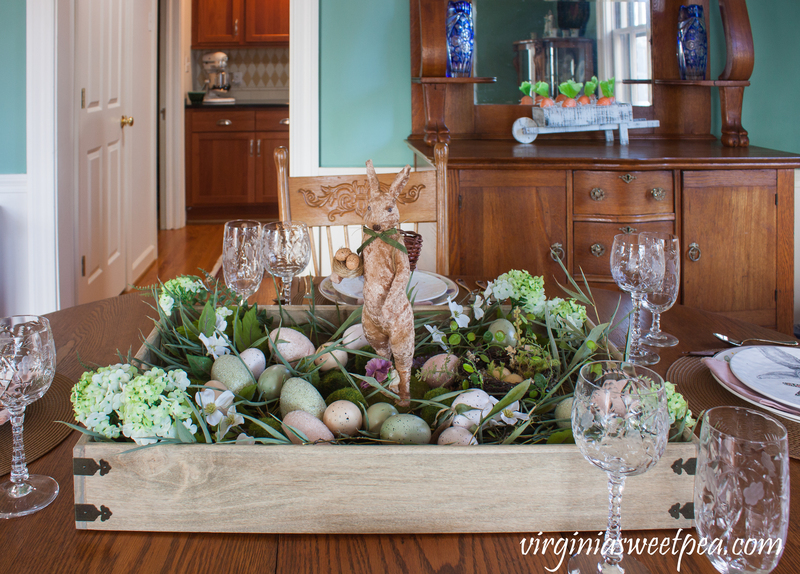 I’m so glad that Easter is late this year and that I’ll have the rest of March and most of April to enjoy this farmhouse style Easter centerpiece. 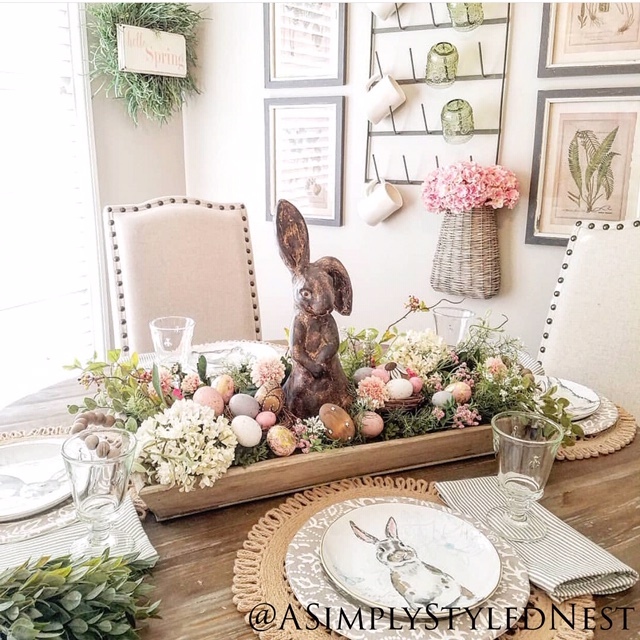 Lisa’s inspiration picture included rattan placemats, pretty base plates, Easter bunny salad plates, glasses, silverware, and napkins. 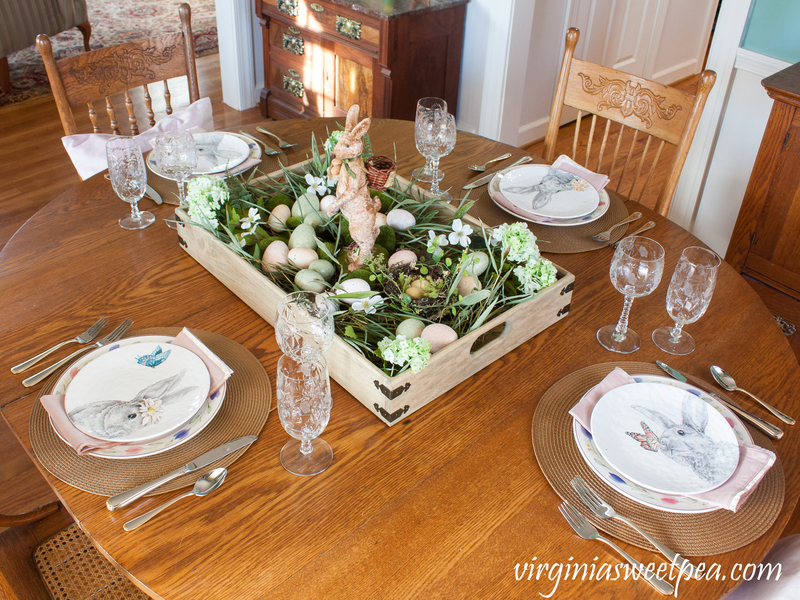 To get Lisa’s look I purchased bunny salad plates and pink napkins from Pier1. The rest of the table was set using things that I already own. My table is an antique that my grandfather purchased and refinished long ago for my parents. The chairs belonged to my maternal great-grandmother. I used my wedding silverware, Gorham Golden Ribbon Edge along with my maternal grandmother’s “Villars” by Rock Sharpe crystal. This 1930’s crystal is so pretty in person and I treasure it since it was my grandmother’s. 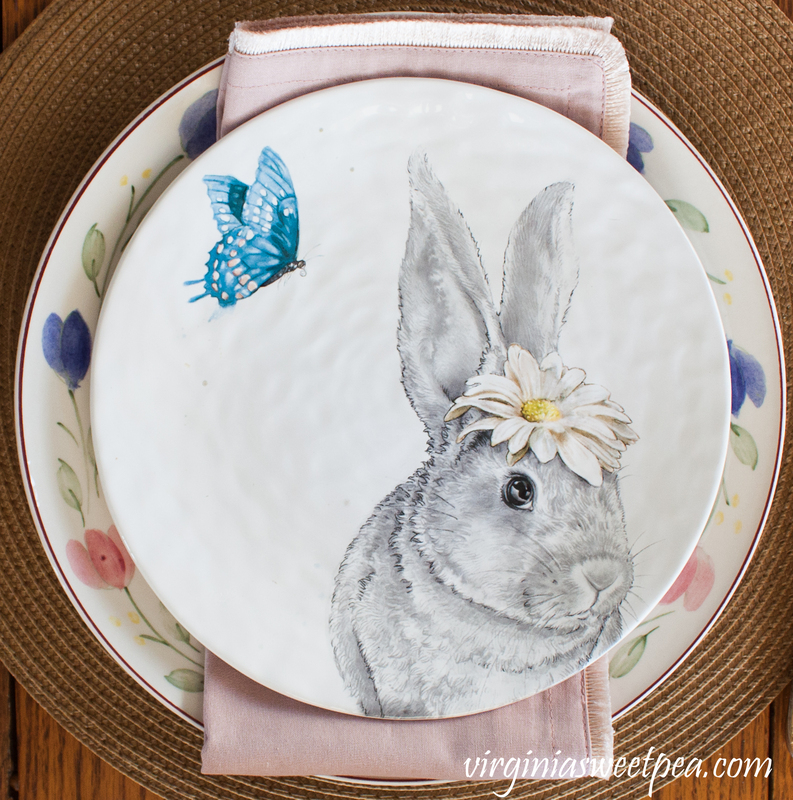 Aren’t these bunny plates from Pier1 adorable? They come in a set of four. 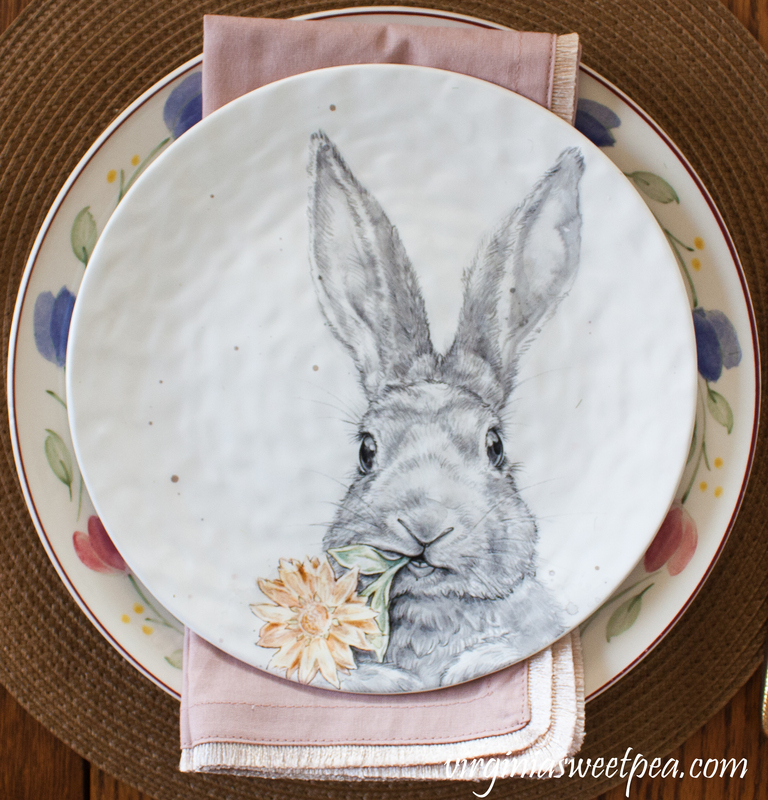 I paired the bunny plates with a set of everyday dishes that I’ve had for over 25 years. I used pink napkins that I found on sale at Pier1 to coordinate with both the bunny plate florals and the floral design on the edge of my plates. 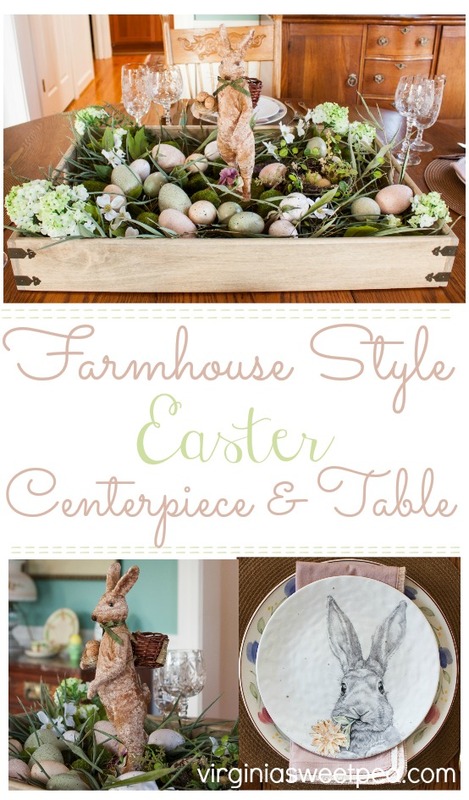 I hope you got some ideas for creating a Farmhouse Style Easter Centerpiece and for setting your Easter table from this post. 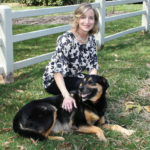 Next on the tour is Leslea from A Heart Filled Home . I’m looking forward to seeing Leslea’s version of Lisa’s inspiration table. 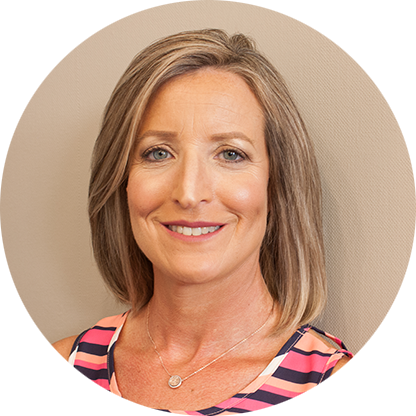 Click on the links below to visit each blogger who is sharing their version of Lisa’s inspiration picture. I’m looking forward to seeing them all! That bunny is adorable. He has such a cute look. I love that you used the bamboo. We fought it when we lived in Lubbock, Tx. It was a never ending battle. This is such a beautiful table. Bamboo is terrible! I’m glad to finally find a good way to use it. LOL! Your centerpiece is so pretty! I love your bunny, especially love that basket he’s carrying…too cute!! Your plates are adorable! Hugs! Thank you, Benita! 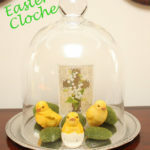 I enjoyed making the centerpiece and I’m glad that Easter is late this year so that I can enjoy this for many weeks. Your vignette has hopped right into my heart! 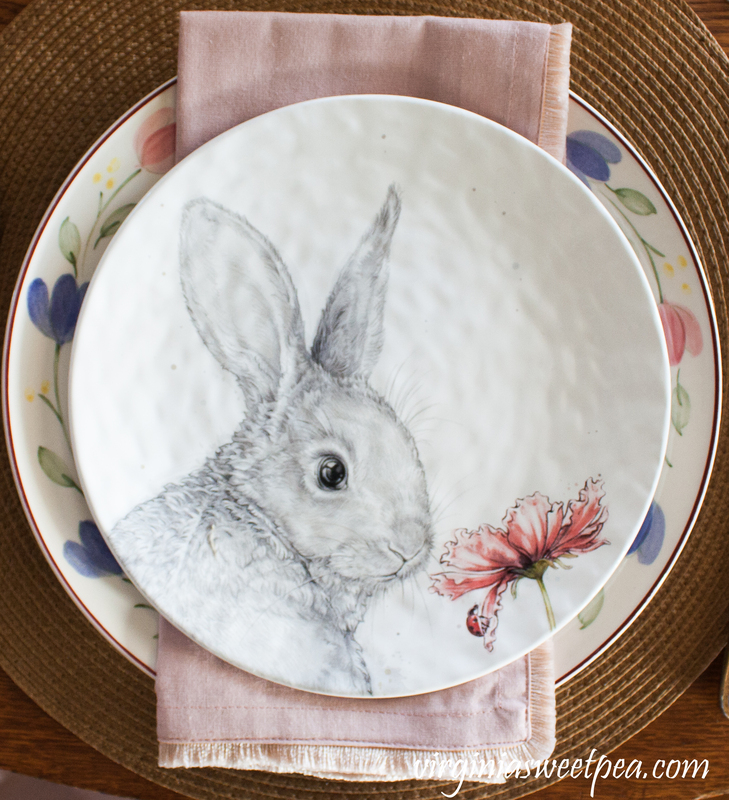 The bunny plates are indeed darling. I adore the wooden box that you created. Thank you, Laura! I had a great time making the centerpiece and setting the table for Easter. Your grandmother’s crystal is gorgeous with the light streaming in, Paula! 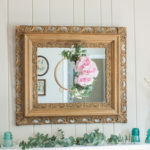 Fun to see another room of your house; I love the wall color<3 Can't wait to see more of your vintage Easter decor! Thank you, Lora! Our dining room has been painted this color for many years. 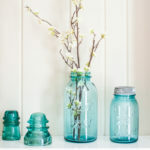 Its inspiration is from Martha Stewart, way back when she had her original show. Paula, I am in love with your version of the challenge piece. 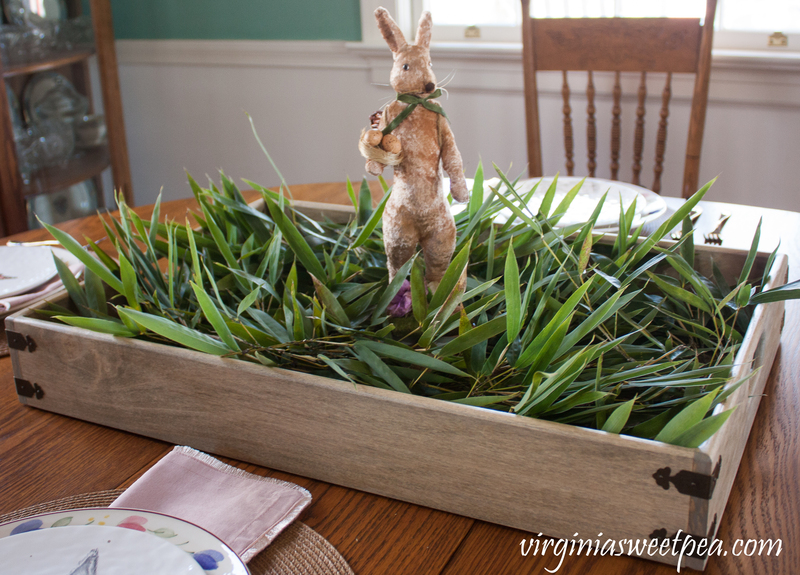 Your wooden box is perfect to hold that lovely rabbit. I am loving your Easter centerpiece. Had a wonderful time working on this Pinterest Challenge. Have a great Easter season. Thank you, Terrie! This challenge was a fun one. What a cute idea! I love your centerpiece and all the greenery in the wooden box. Great job! Thank you, Shelley! 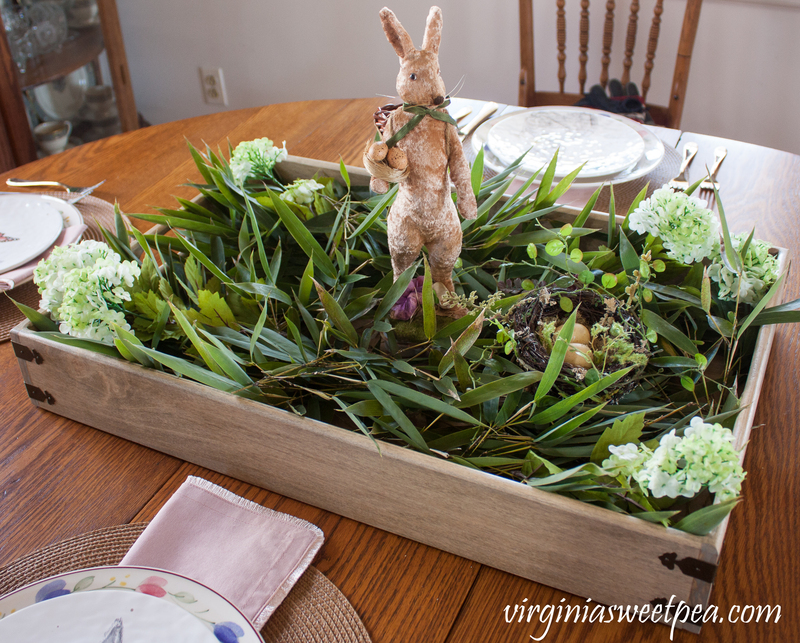 I had fun making this centerpiece and setting the table for Easter. I’m with your BFF Cousin – it’s hard to stop staring at it! 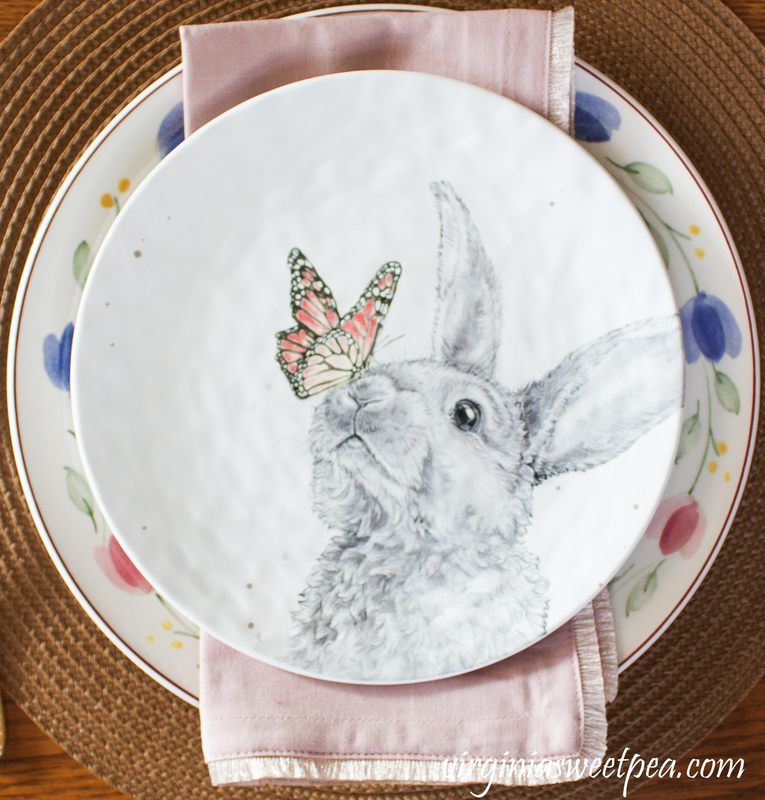 The fantastic bunny, the plates, the centerpiece and hello, the wall color! 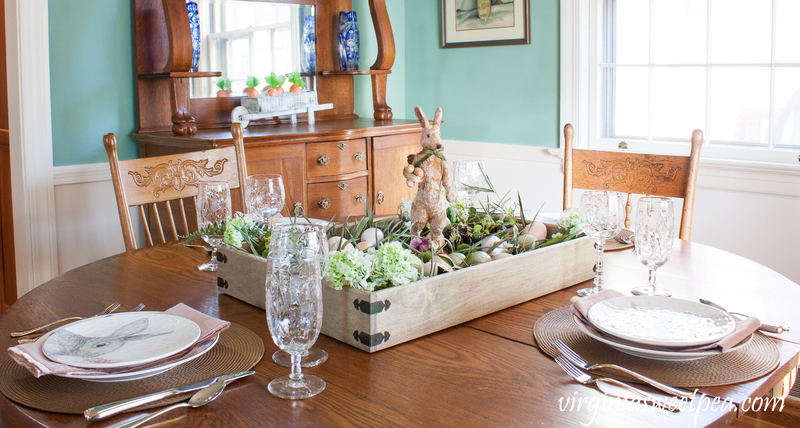 You’ve got the perfect dining room for Spring and Easter! I love it all. Thank you so much for joining in today. Thank you so much, Cindy! 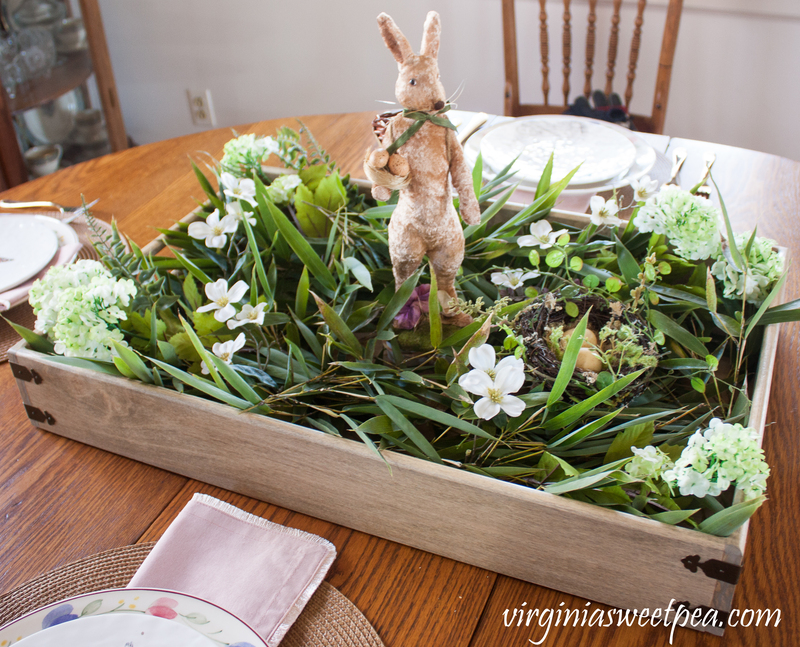 It was so much fun to make the centerpiece and to set the table for Easter. I really enjoyed this challenge and look forward to the next one. Your tablescape is so pretty! 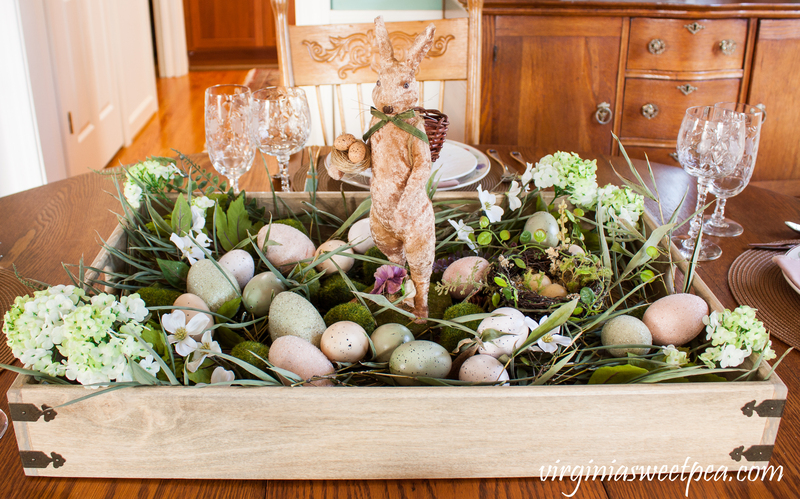 I love the bunny and the centerpiece is perfect for spring! Thank you, Ruth! I’m glad that Easter is late this year so that I can enjoy this centerpiece for a few weeks. Your oversized tray is lovely, Paula. The way you made it look like a garden is adorable, too! Pinned! Thank you, Julie! It was so much fun to make this centerpiece and to set the table for Easter. Paula, I love Pier 1’s salad plates and these are no exception. simply adorable And I want to thank you so much for linking up to our Celebrate Your Story link party. We hope we are providing a celebration of your post and perhaps yours will be chosen as a feature by one of the hosts. I love the tray that you used! And, seriously loving those darling plates!! Everything looks amazing!!! Thank you, Emily! It was so much fun to make the centerpiece and to decorate the table. I’d love to see the lanterns that you are making! love the idea of a box tray with decorations. They look so good like that. perfect Easter table. Thank you, Debbie! I had a lot of fun making the centerpiece and setting the table. 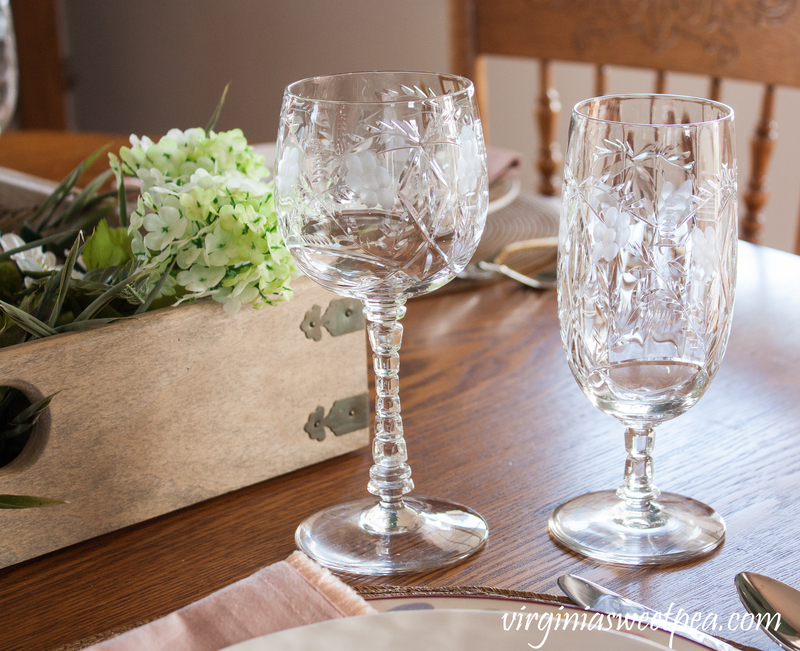 Your grandmother’s glassware is beautiful and I’m in love with those bunny plates! Very pretty, Paula! Thank you, Linda! I am lucky to have inherited this crystal and I love using it because it reminds me of my grandmother. Thank you, Sheila! I’m lucky to have inherited this crystal. You are so sweet, CoCo! Thanks so much for your kind comment. I just adore this entire room. Your furniture is just beautiful. It’s always a pleasure to read about all of your family heirlooms. 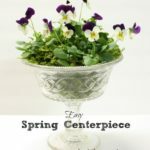 Lovely way to welcome spring with this precious centerpiece. Paula what a cute, cute centerpiece and tablescape! Your rabbit is so unique and eye catching! 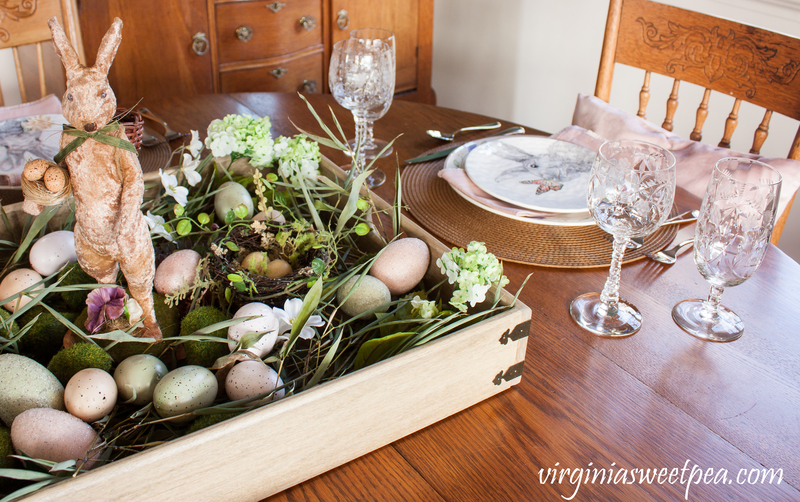 I love that you made your tray and it is perfectly styled with spring goodness. So happy to be joining you for this challenge. Happy spring! Thank you, Amber! I so much enjoyed seeing how everyone on the tour used our inspiration photo to style their centerpiece. What a fun challenge! Your table turned out lovely. I love those little bunny plates. So cute! I am definitely ready for spring and looking forward to Easter, as well. Thanks so much for sharing at Sweet Inspiration! 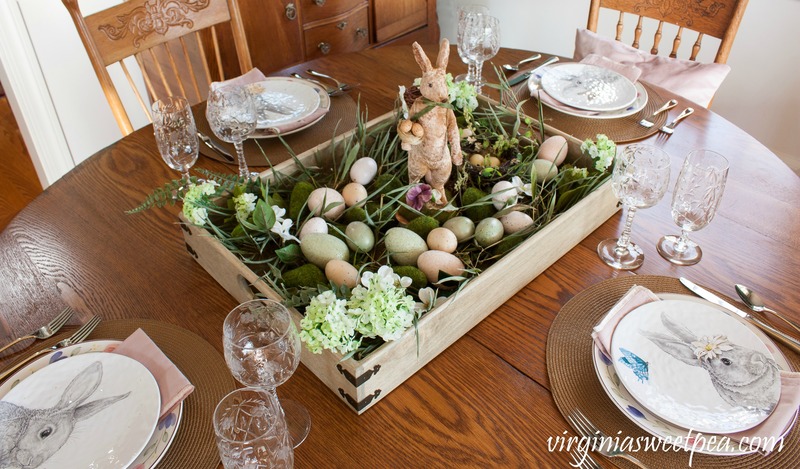 I just love that tray, and the tall bunny makes such a statement! I love it so much – great job! I love the way you incorporate your grandmother’s glasses, and used your 25 year-old dishes with those fabulous new salad plates. 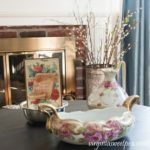 I was featured next to you on “You’re The Star Blog Hop,” and wanted to drop in and check out your centerpiece! Have a great week! Thank you, Kristie! Even those those dishes are old and not a new and fashionable pattern, I still love them.